Long Island has an early history of roads and automobiles in America. Today, it can surely be said that Long Islanders are living up to this American legacy. There are 19 major highways on Long Island. The most travelled you can say are the major roads like the Long Island Expressway (LIE), Northern State Parkway, and Southern State Parkway. There’s so much ground to cover, totaling 1,377 square miles of land area. There's also the LIE running a significant width of Long Island and serving as a main artery. It’s no surprise that the LIE is a road heavily travelled on each day and known to be congested at all-times of the day that it has earned the recognition by locals as “The World’s Longest Parking Lot.” The following is a listing and brief description of the main roads and other highways. View of Long Island Expressway looking East from Sagtikos Parkway Bridge. I-495, commonly known as the Long Island Expressway or LIE, is Long Island's main freeway. It runs for 71 miles all the way from the Queens-Midtown Tunnel in Manhattan to County Route 56 in Riverhead, just before the forks split on LI's east end. Though it does not connect directly to its parent route, I-95, it is adjoined to the I-95 via I-295 in Queens. The route was built in stages over the course of the mid-20th century with the first section, the Queens-Midtown Tunnel, opening to traffic in November of 1940. The last two miles between exit 71 and CR 58 were completed in June of 1972. HOV lanes were later added and now run from exit 31 to exit 64. View of Northern State Parkway Eastbound West of Wantagh Parkway. The Bethpage Parkway is just under two and a half miles long and connects the Southern State Parkway with Bethpage State Park. As it is a park of the State Parkway system, commercial traffic is not permitted. This road travels North and South through Nassau County. The Meadowbrook Parkway is part of the State Parkway system, serving as an alternate route to Jones Beach. It travels North and South through Nassau County and no commercial traffic is permitted on this road. Also referred to as Northern Parkway or simply the Northern State, this limited-access state parkway connects Northern Suffolk County with Nassau and Queens. It stretches just under 29 miles long and runs from the border of Nassau and Queens to Hauppauge. 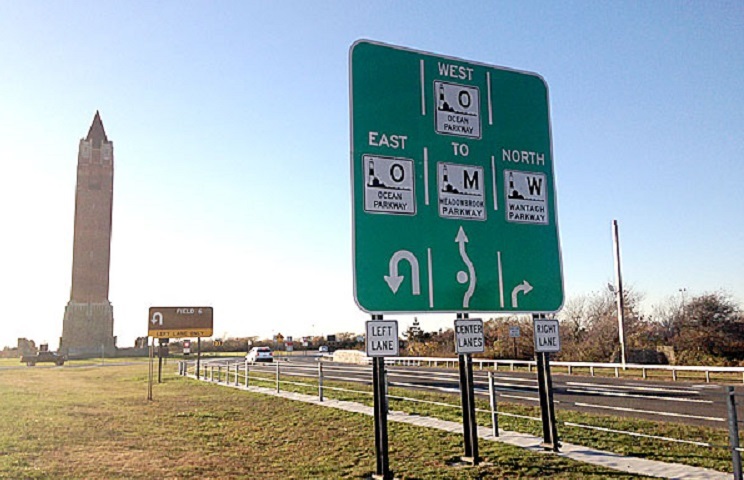 In western Nassau the parkway contains three lanes of traffic in each direction, but it narrows to two near exit 33. Construction on the Northern State occurred in stages from the 1930s through 1965, when its current end in Hauppauge was finished. The Northern State does not actually end in Queens, but instead changes names to the Grand Central Parkway. Commercial truck traffic is not permitted on the Northern State due to low overpasses. View of Water Tower traffic circle at Jones Beach where Ocean Parkway encounters the Wantagh State Parkway. The Ocean Parkway travels East and West along the south shore of both Nassau and Suffolk Counties. The Sagtikos Parkway connects the Sunken Meadow and Southern State Parkways in Suffolk County, providing easy access to the Robert Moses Causeway. The Southern State Parkway travels East and West connecting New York City and East Islip in Suffolk County, and becomes the Heckscher State Parkway. Wantagh State Parkway travels through Nassau County and provides access to Jones Beach State Park. Heading Westbound from Sunken Meadow Parkway on Route 25A in Fort Salonga. Route 25, or Jericho Turnpike, is a major East and West travelling highway that spans the distance from east midtown Manhattan to Orient Point at the end of Long Island's northern tip. Route 27, or Sunrise Highway, travels East and West on the South Shore of Long Island between New York City and Montauk Point in Suffolk County. Route 27A, commonly known as Montauk Highway, connects Jamaica, Queens to Montauk Point, the eastern most point on the southern tip on Long Island. View from Route 106 Newbridge Road Southbound from Hemptead Turnpike in East Meadow. Route 106, also know as New Bridge Road, travels North and South through Nassau County connecting Bellmore and Cold Spring Harbor. Route 107, commonly known as Hicksville Road, connects Glen Cove, Hicksville and Massapequa. 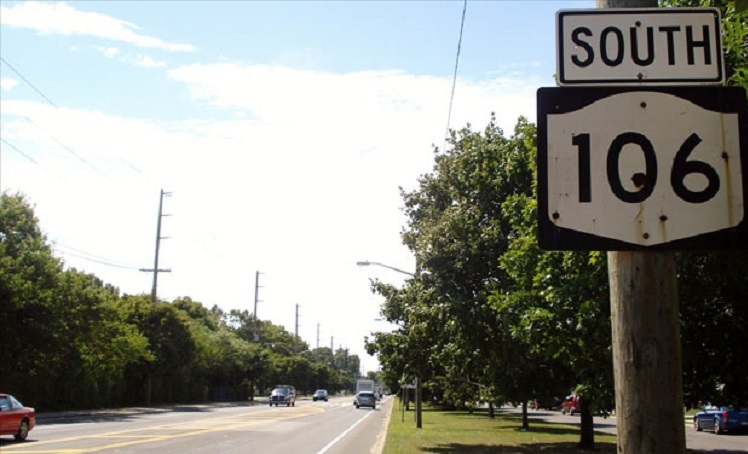 Route 110, also know as Broadhollow Road, travels North and South near the border of Nassau and Suffolk Counties, connecting Amityville and Huntington. Route 135, the Seaford Oyster Bay Expressway connects Wantaugh and Seaford in Nassau County. Route 231, commonly known as Deer Park Avenue is a four lane highway in Suffolk County that predominantly travels North and South. Route 454, also known as the Veteran's Memorial Highway, provides easy access to Suffolk County Government Offices, and connects several major highways in Suffolk County. The Hempstead Turnpike is and East-West road connecting Queens County and Farmingdale.